Play Area - West Bay, Bridport, Dorset - Play Area. An innovative new play area opened at West Bay in May 2010. 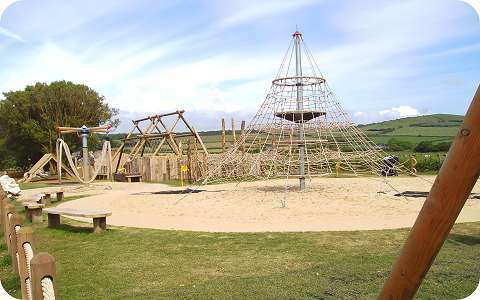 This unique play area has been designed to reflect its setting on the Jurassic Coast and the area’s history of rope making. The purpose built design is based on a “ship” wrecked on the rocks and broken into three pieces, with robust climbing structures and swings. The Town Council will be working with a local company, rope and net specialists Huck Nets, to build the play area, which is to be sited between the main West Bay Road car park and the cycleway footway (the old railway line) just north of the station. The land to be used is to be transferred from West Dorset District Council to the Town Council. Work on the play area started over the winter and opened in May 2010. The play area is being provided with funding from Bridport Town Council, West Dorset District Council, the Dorset County Council’s Playbuilder Programme (funded by the Department for Children, Schools and Families), Dorset County Council’s Youth Capital Fund and the Bridport Charter Fair. He explained that the twenty young people on the first Summentor Project had identified the need for a play area for those of their own age, had helped research the demand and then set about designing the area themselves. A very promising funding bid to the Big Lottery had then, however, failed to come through. “We will create a place where teenagers can go. It will be the first teenage playground in West Dorset and it has been designed by us teenagers. It’s not just for teenagers but it will be mainly for teenagers because we don’t have places to go like little kids do. In West Bay there is literally no place to go. There’s no place we can go where people don’t look at us like we shouldn’t be there. We are trying to do something positive and go against the media and its labelling of teenagers. “If you’ve got nowhere to go and nothing to do, you can get bored and with some people this can lead to vandalism, bad behaviour and sometimes violence. Creating a good place with a good atmosphere is a positive thing to do. It will be ours. We will feel safe there and we think others will too. “We’re going to enjoy being there. It will be ours and for teenagers like us and we think everyone will enjoy it. It won’t be just us. We think everyone will want to use it. It’s been designed for teenagers but we know other ages, young and old, will want to use it. That’s okay. We will be achieving something special. It’s good to think that lots of people will benefit from it and also the teenage image will be improved. Copyright © 2009 - 2019 WestBay.co.uk. All rights reserved.